Do you know the differences between a muffin and a cupcake? Technically speaking, a cupcake is sweeter than a muffin and uses butter and eggs as major ingredients. Cupcakes are also often made with candy. Muffins, on the other hand, are generally not as sweet as cupcakes and are made with healthier ingredients, such as wheat flour and fruit. Also, muffins are usually denser and drier than cupcakes. Given the healthier nature of muffins, next time you want to enjoy a cupcake, try a muffin instead. This article contains delicious and healthy muffin recipes that anyone will enjoy. Blueberry muffins are one of the quintessential muffin types. The following recipe produces tasty muffin classics. Preheat the oven to 375 degree Fahrenheit. If a non-stick muffin pan is not being used, coat the muffin pan with a non-stick spray. Use a whisk to mix together wheat germ, baking powder, salt and the whole wheat flour into a suitable bowl to make the dry mixture. Then mix the vegetable oil, plain yogurt, sugar and eggs together in a separate bowl to make the wet mixture. Mix the dry and wet mixtures together until incorporated. Mix the blueberries into the combined mixture until evenly distributed. Fill each muffin cup to about 2/3 to 3/4 full. Place muffin pan into oven for about 20 minutes. Muffins will be done when a toothpick inserted comes out clean. When the muffins are done, cool them on a wire rack before serving at desired temperature. Storage notes: The muffins can be stored in a covered container for approximately 24 hours at room temperature or about 30 days frozen. 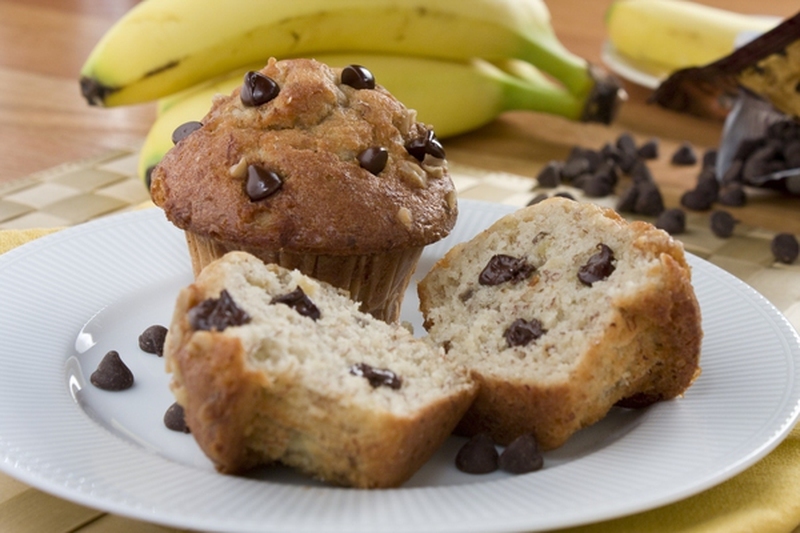 Wondering how to provide healthy muffins for kids? If so, as long as they like chocolate (who doesn’t?) the following muffin recipe is perfect. Mix the following ingredients into a large bowl: all-purpose flour, sugar, baking cocoa, baking powder, baking soda and salt. Mix in the milk, vanilla extract and yogurt until all ingredients are moist and evenly mixed. 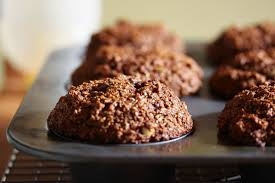 Coat a muffin pan with a non-stick spray or suitable alternative, then fill the muffins cups until they are 2/3 full. Bake muffins for about 17 minutes. Muffins will be finished when a toothpick comes out clean. Place the muffins on a wire rack until cool enough to handle. The following recipe is great for providing muffins for kids since it provides a serving of fruit which is really delicious and has few calories per serving. Use non-stick spray on the muffin pan or place paper muffin cups into the pan. Mix the following dry ingredients together in a bowl: flour, baking soda, baking powder and table salt. Blend the mashed bananas, egg, vanilla extract, apple sauce and sugar into a separate bowl. Combine and blend the dry ingredients with the banana mixture. Fill each muffin cup about 2/3 full and then bake for about 17 minutes. Muffins will be done when a toothpick comes out clean. Remove the muffins from the oven and cool before serving. One of the more healthy muffin recipes, it also allows for the opportunity to get creative. You can add other ingredients to make things interesting, such as nuts or fruit pieces. Place the wheat bran on a baking sheet and bake until lightly browned. Boil the pitted dates and orange juice in a saucepan. Reduce heat and let simmer for 20 minutes. After the date and orange juice mixture has cooled, put into food processor and blend until smooth. Add the following ingredients to the date and orange juice mixture while it is still in the food processor: vanilla extract, buttermilk, mashed banana, melted butter and vegetable oil. Blend until smooth and uniform. Mix the following ingredients into a medium bowl: whole-grain flower, baking soda, ground cinnamon and table salt. Mix the bran mixture with the date and orange juice mixture, then add eggs and mix until moistened. Spray muffin pan with non-stick spray and fill muffin cups until about 2/3 full. Bake muffins for about 30 minutes at 350 degrees Fahrenheit. Muffins will be done when a toothpick can be removed cleanly. Great for pumpkin season, the following muffin recipe is filled with autumn flavor! They’re also super tasty and very healthy. Mix the all-purpose flour, oatmeal, baking powder, baking soda, pumpkin pie spice and table salt into a large bowl. Mix the following ingredients into a separate bowl: mashed banana, pumpkin, brown sugar, eggs whites, applesauce and unsweetened almond milk. Combine the flour and pumpkin mixture into a single bowl and carefully stir in the chocolate chips. Spoon the muffin batter into the muffin pan cups until each cup is about 2/3 full. Bake for about 25 minutes. Muffins will be done when a toothpick can be removed cleanly. Remove from oven and allow the muffins to cool until desired temperature is reached. For a few more great muffin recipes, check out this link.